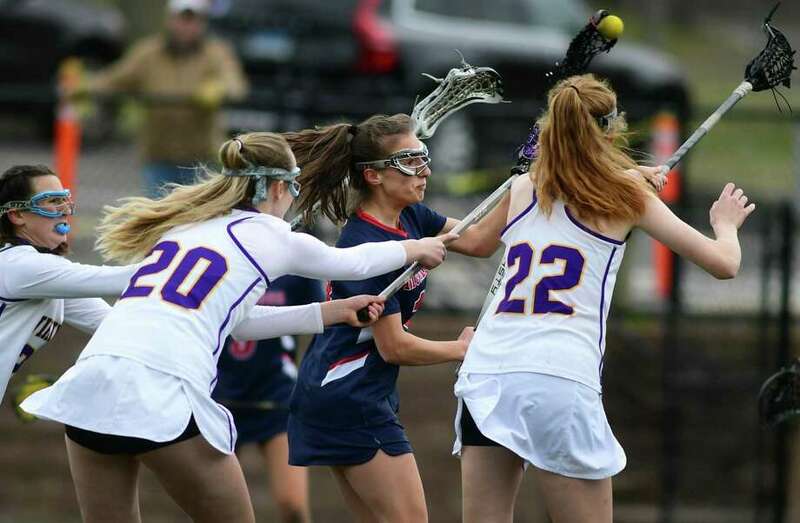 Senator #10 Sophia Tarasidis takes a shot a goal as the McMahon High School Senators take on the Westhill High School Vikings in their FCIAC girls lacrosse game Thursday, April 11, 2019, in Stamford, Conn.
STAMFORD — McMahon and Westhill are two girls lacrosse programs in the process of establishing credibility while playing in the demanding FCIAC. So it was a fair battle Thursday as the Senators and the Vikings met Thursday at Westhill. At the moment, it appears that McMahon’s growing squad is ahead of Westhill’s as the Senators fashioned a 12-7 triumph. On this overcast afternoon, McMahon took control in the final minute of the first half. Westhill was called for two-minute penalties with 42.4 seconds and 9.7 seconds left before intermission. McMahon’s Anna Makover and Georgia MacInnes each scored powerplay goals off free positions to give the Senators a 6-3 halftime edge. Then McMahon senior co-captain Charlotte Hussey scored just 3:08 into the second half for 7-3. Westhill never got closer than 7-5 the rest of the way. McMahon’s freshman goalie Morgan Carroll collected seven saves in the victory for the Senators (3-2, 2-2 FCIAC). Anna Makover, McMahon: The sophomore collected five goals, most on free position situations, to pace the Senators’ attack. The Senators were 10-8 overall last season and qualified for the Class L playoffs. They won a play-in game over Trumbull before losing to Greenwich. The value of that experience is showing this year although McMahon has just five seniors on the roster. At 3-3 overall, 1-3 FCIAC, Westhill is taking a big step after last season’s 4-12 campaign. The Vikings have toppled Norwalk, Avon and St. Paul Catholic thus far. Records: McMahon 3-2, 2-2 FCIAC; Westhill 3-3, 1-3 FCIAC. Scoring: M—Margaret Sovak 1 goal; Sophia Tarasidis 1g; Anna Makover 5g; Georgia MacInnes 1g; Charlotte Hussey 1g; Meghan Sisk 2g; Olivia Bartilucci 1g, 1 assist. W—Peyton Hackett 1g; Audra Hansen 2g; Emily Reid 2g; Grace Hansen 1g; Margot Buckey 1a. Goalies: M—Morgan Carroll (7 saves). W—Ava Feliciano (5 saves), Mary Leydon (1 save).